In the previous chapter, entitled Working with iOS 4 iPhone Databases using Core Data, an overview of the Core Data stack was provided, together with details of how to write code to implement data persistence using this infrastructure. 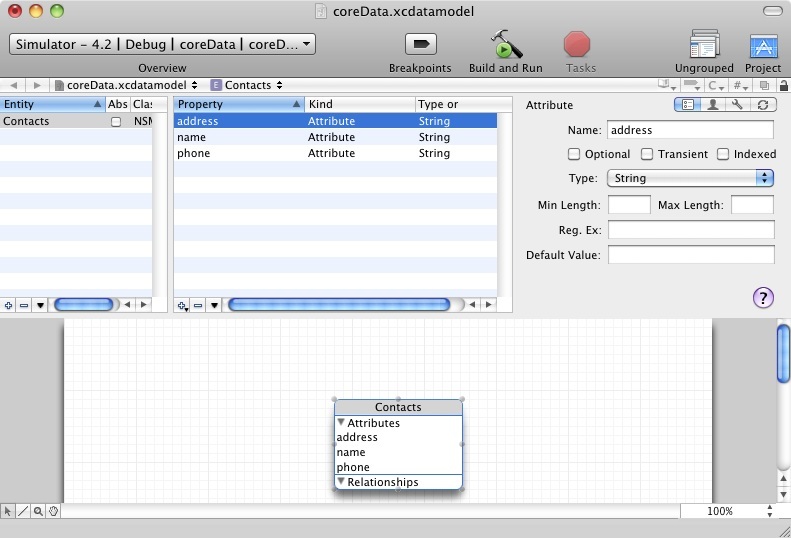 In this chapter we will continue to look at Core Data in the form of a step by step tutorial that implements data persistence using Core Data in an iOS 4 iPhone application. As is often the case, we can rely on Xcode to do much of the preparatory work for us when developing an iPhone application that will use Core Data. Currently, however, only the Navigation-based Application, Utility Application and Window-based Application project templates offer the option to include support for Core Data. To create the example application project, launch Xcode and select the option to create a new project. In the new project window, select the Window-based Application option. In the Options section of the window make sure that the product menu is set to iPhone and that the check box next to Use Core Data for storage is selected, click the Choose... button and name the project coreData. 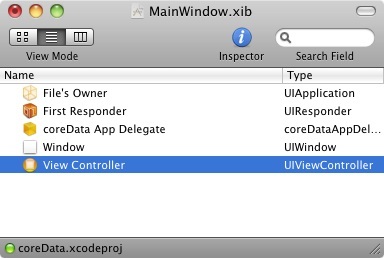 Xcode will create the new project and display the main project window. 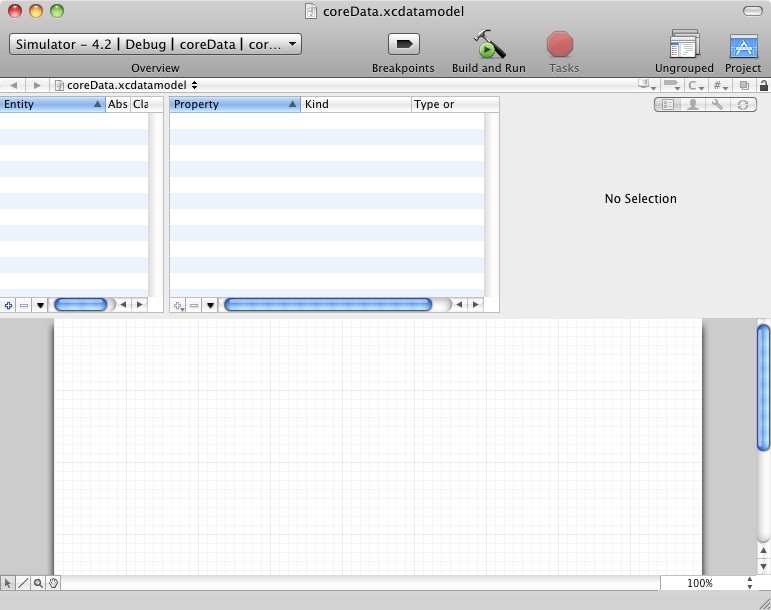 In addition to the usual files that are present when creating a new project, this time an additional file named coreData.xcdatamodel is also created. This is the file where the entity descriptions for our data model are going to be stored. Save the entity description (File -> Save) and close the editing window. The entity is now defined and it is time to start writing code. 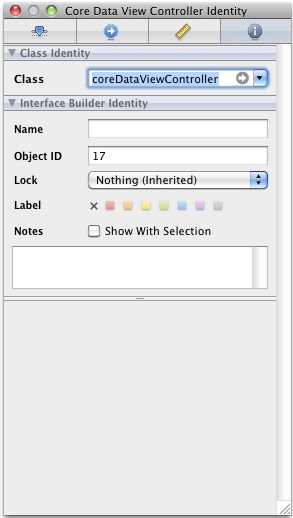 Within the main Xcode project window, ctrl-click on the Classes folder located in the Groups and Files panel. From the popup menu, select Add -> New File... 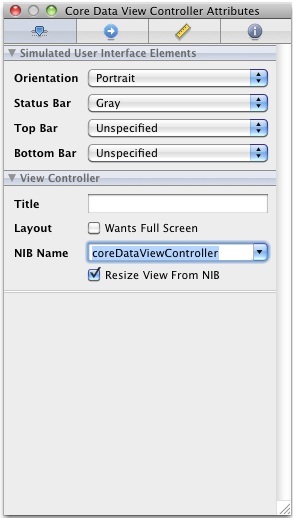 In the new file window, select the iOS Cocoa Touch Class category followed by the UIViewController subclass icon and make sure that the UITableViewController subclass check box is not selected, but that the With XIB for user interface option is selected. 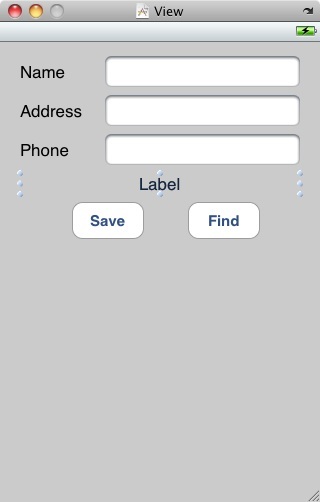 Since we are developing an iPhone app, also ensure that the Targeted for iPad option is not selected. Click Next, name the file coreDataViewController.m and make sure that the Also create coreDataViewController.h file option is selected before clicking on the Finish button. Once the changes have been made, be sure to save both files before proceeding. Failure to save the changes at this point will possibly cause problems in later steps. Save the file and exit from Interface Builder. Once the changes are complete, save the file before proceeding. Next, connect the three text fields and status label to the name, address, phone and status outlets respectively by holding down the Ctrl key and clicking and dragging from File’s Owner entry in the documents window to the corresponding component. 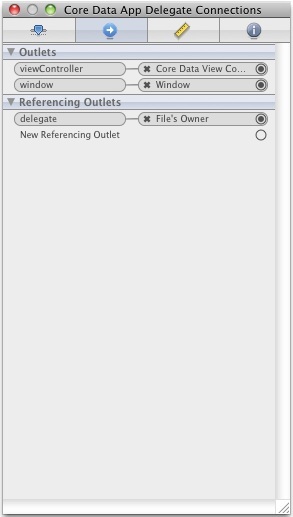 From the resulting menu select the outlet corresponding to the selected view object. The last step involves connecting the two buttons to the corresponding actions. First, display the Connections Inspector (Tools -> Connections Inspector) then select the Save button. Click inside the small circle next to the Touch Up Inside event in the Connections Inspector window and drag the blue line to the File’s Owner. To establish the connection, select saveData from the resulting menu. 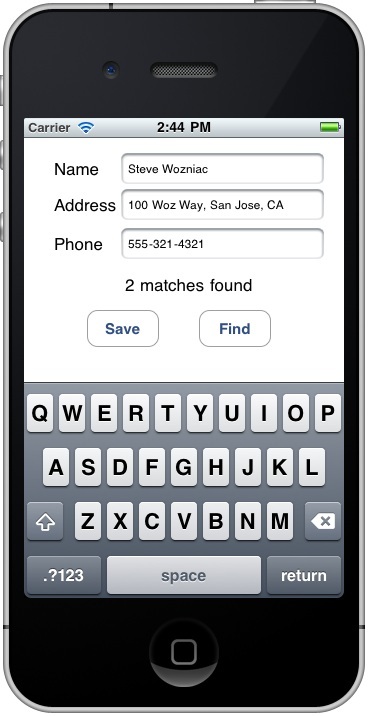 Repeat these steps to connect the Find button to the findContact action before saving the design and exiting Interface Builder.